Biljana Petrovska received her education from the State Music and Ballet School Center Ilija Nikolovski Luj in Skopje, where she finished primary and secondary musical education. She graduated in theoretical and instrumental piano department at the same time, in the class of Professor Rita Trpcheva – Popovich. 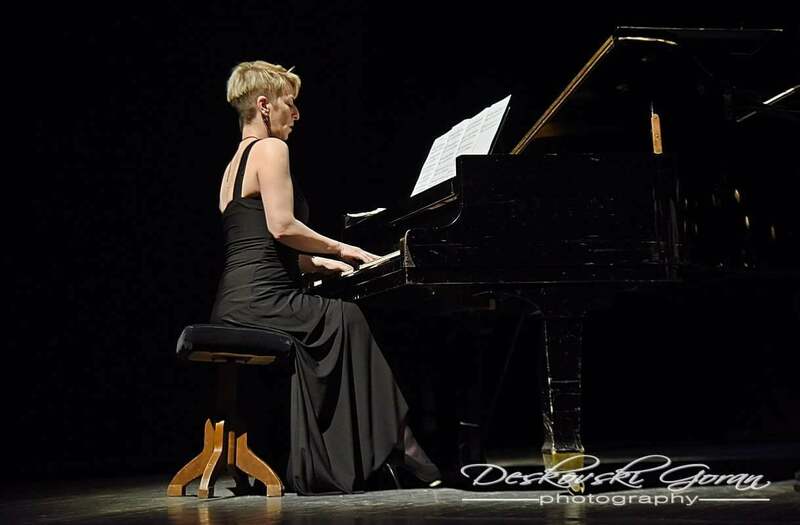 She got her postgraduate diploma (1997), and master’s degree (2002), in piano interpretation in the class of Professor Evushka Elezovic from the Faculty of Music Art in Skopje. During her education Biljana Petrovska participated in many seminars, as is the First International Festival in honor of Vladimir Horovic in Aveiro – Portugal. In 2004, in Paris she had residence for two months in the City the Art, where she had one solo concert, and two concerts with solo singers. As a soloist, as well as in camera orchestras she regularly performs throughout Macedonia. Besides solo performances, her interpretative creativity is focused in chamber music. She performs with many Macedonian artists. In 2005 she established Duo Pan together with the clarinet performer Petar Kolevski. During their long term collaboration they have realized many concerts, and recorded a compact disc Clarinet Fantasies. Biljana Petrovska is a founder and regularly performs with the camera orchestras Trio, VivArt and quartet Animus. As a solo performer she has also been performing New Age music, tango compositions, jazz standards, and folklore musical processing. So far Ms Petrovska has already performed in almost all Macedonian towns (Kumanovo, Stip, Struga, Tetovo, Veles, Strumica, Kavadarci etc.) as well as Belgrade, Vranje (Serbia), Belgrade (Serbia), Aveiro (Portugal), Paris (France), Drach and Skadar (Albania), Zagreb and Osijek (Croatia) and Sofia (Bulgaria). In the field of chamber music one of the most important projects is with the quartet “The Quartet” she started cooperating with in 2017. The quartet interprets classical jazz, and they started their cooperation by performance of the jazz suite by Claude Bolling for flute and jazz piano trio. She is a full time employee at the State Musical and Ballet School Center Ilija Nikolovski – Luj as an associate and piano professor. Being a piano professor so far, she has achieved many successes with her students at many state and international competitions. Since 2012 she has been working as a part time art associate at the Faculty of Music Art in Skopje. In 2015-16 she participated as a first piano in the Big Band for the musical performance Chicago at the Macedonian National Theatre – Skopje.